During the five year stint I spent growing up in Al Khobar in Saudi Arabia, it was common knowledge that if you wanted to get a damn tasty pizza you went to ‘Pizza Sheikh’. Hands down, it was the best pizzeria in town to order an American style pizza. Their pepperoni pizzas where simply fantastic, way better than the ones from Pizza Hut. So imagine my disappointment when I got back to The Netherlands and discovered that pizzas here didn’t come with a pepperoni topping. All they had was ‘salame’; thin slices of soggy salami. It’s not that bad, but it sure as hell isn’t the same as pepperoni. I prefer anchovies on Italian pizzas. Fortunately, with time I noticed that the pepperoni pizza started becoming commonplace and you could finally order pepperoni pizzas pretty much everywhere in The Netherlands. But the pizzas here where never as good as the ones I got in Saudi Arabia. Either they used the wrong kind of cheese, or too much cheese, or the pepperoni is soggy, or the crust was too soft, or the tomato sauce wasn’t right, or the pizza wasn’t cooked properly, etc. It’s usually a combination of these factors and consequently my experiences with ordering food in The Netherlands are mostly disappointing. And I also can’t attribute this disappointment to an unreasonably high expectation pattern, as if I was only comparing my gustatory encounters in The Netherlands with distant memories I have of eating pizzas in Saudi Arabia as a kid. Because I went to Greece this summer, where I ordered a very tasty pizza on two separate occasions from two different pizzerias. Both of these pizzas easily beat any pizza I have ever eaten in The Netherlands. One of the pizzas I partook of this summer originated from a Domino’s in Athens. That surprised me, because we have Domino’s in The Netherlands too! So why would a pizza from a Domino’s in Greece taste so much better than a pizza from a Domino’s here? Well, I think it all boils down to voting with your money. In Greece, there is a food-culture you see? People there are actually quite critical of what they eat. Just try finding a McDonalds in Athens, for example. In Greece if the food isn’t decent, you simply don’t get enough customers and your business goes belly-up. So what does that say about The Netherlands? Quite simply, it says that here in the Netherlands people generally appear to have lower standards when it comes to culinary taste. Just try finding a McDonalds here, they’re pretty much all over the place! Now look at the picture below. It is a photograph of the pizza I ordered this evening. It was not delicious (so-so cheese, soggy crust, so-so pepperoni) and it looked like the delivery guy had been driving off-road or something. This is not an exception: I have tried many pizzerias all over the country and with perhaps a single exception, the gamut of culinary butchery I have encountered universally ranges from mildly disappointing to just plain godawful. Fortunately, I travel to Greece often ;). 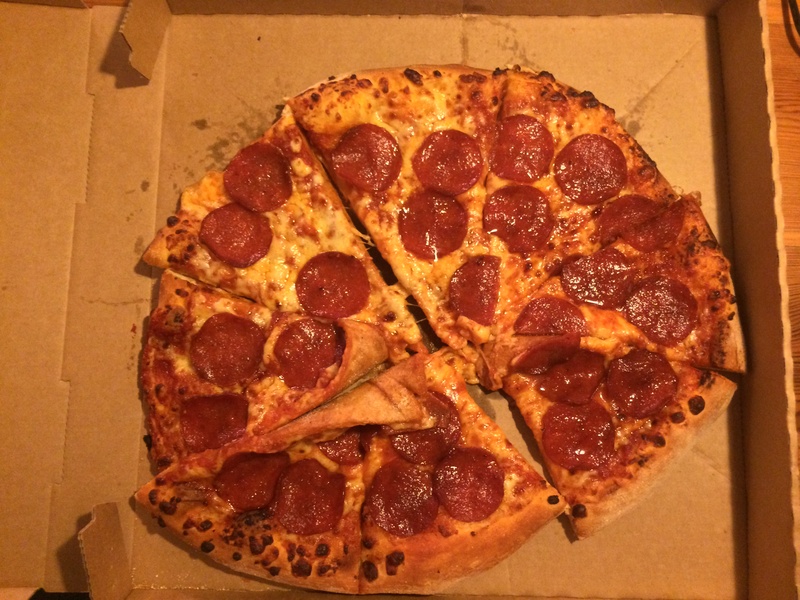 Is it ironic to order a ‘perfect pepperoni’ and then receive this?